All schools are entering a period of great change in education with lots of new courses being graded using a number system (9-1) instead of the traditional letters (A*-G) for GCSE qualifications. This measure has been scrapped by the government because it did not give any indication of a school’s performance as it did not reflect the abilities of the students when they finished started secondary school. 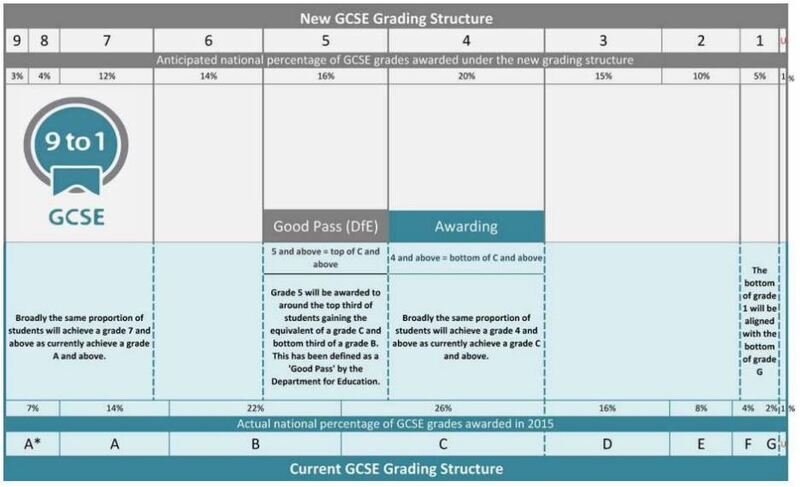 The four new ‘Headlines’ will be as follows; a score for Attainment 8, % of students achieving Grade 5 or better in both English Language and Maths, % of students achieving the English Baccalaureate and the % of students who entered the 5 relevant subjects to potentially gain the English Baccalaureate qualification. Attainment 8 / Progress 8 is the combined points total achieved by all students in a ‘balanced’ 8- subject KS4 curriculum. If a student did not choose to study in certain subject areas to fit this model, they would have zero points allocated in those slots. The Attainment 8 scores for all students are then averaged out across the whole Year 11 cohort. Last year our Attainment 8 score was 53.5pts. (equivalent of every student gaining a C+ for all eight contributing GCSE’s sat). This score will then be used to generate the schools Progress 8 score which will compare the progress of all our students with the exact same ability across the whole of England. This provisionally will be available in October 2017 then validated in late 2017/early 2018 once all remarks and appeals have been considered. The English Baccalaureate or EBACC is ‘achieved’ (though no certificate is provided) by a student gaining a C grade (new Grade 5 for English and Maths in 2017) or better in the following 5 subjects; English Language, Mathematics, Science (Double or Triple but not BTEC), a modern language (French, German or Spanish) and either History or Geography. This would indicate that approximately two thirds of the students that achieved a C grade in previous years would NOT have achieved a Grade 5 and therefore would NOT have been included in the measure. To try to see what such headlines would have been for previous cohorts, the following calculated adjustments have been made to previous cohorts of students English and Maths results. As you can see the headlines in previous years would have looked quite different (13-15% less) under this new system and it is worth noting this when viewing the 2017 figures when the results come in this August.